Who hasn’t felt the need for some healthy dinner ideas, at least one a week? If this ressonates with you … Welcome to episode 7 of Glow Chef Radio! We’ll be talking about making weekday dinners work for someone who wants to eat healthily without spending hours in the kitchen, after a full workday. Why dinner is such an important meal. Making room for dinner in your daily schedule. Planning menus to avoid boring routines. Easy tricks for fast and easy cooking. 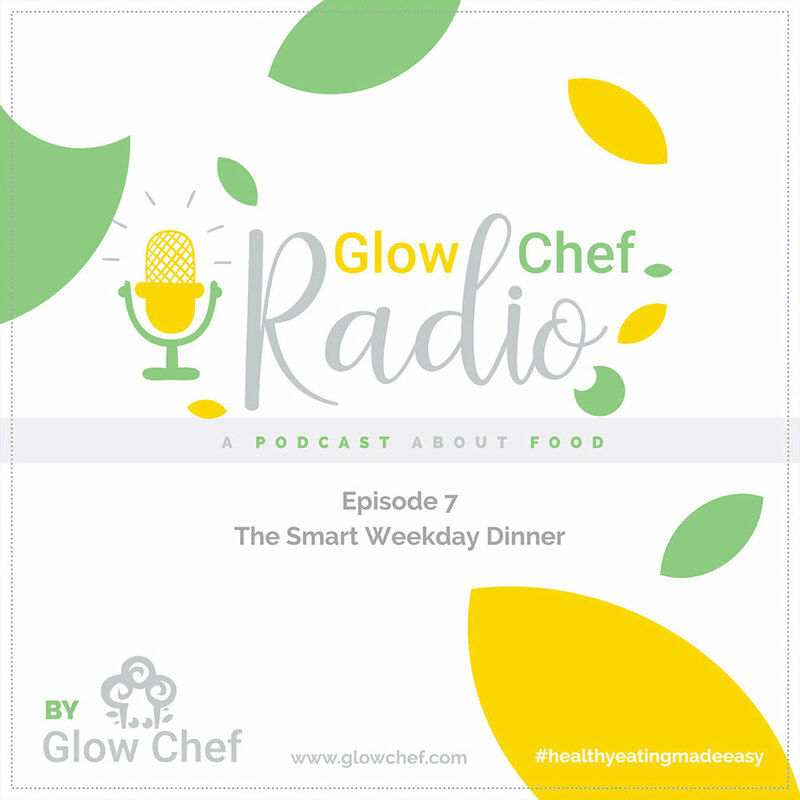 Up to now, here on Glow Chef Radio, we have seen how to plan, shop for and cook healthy meals that will ensure at least 80% of your meals are really nutritious and tasty. Easy to adapt both to small and large households. Please women and men, grown-ups and children alike. Are super adaptable in terms of individual portions and nutrition goals. Work as well for vegans and vegetarians as for flexitarians. Need more help? I can mentor you! If this is something that you find interesting, but you feel you would need a bit more help with, because you need to customize it to your individual circumstances, or need a little help getting started – we all know that kick-off can be the hardest – keep in mind that I can help you with my one-to-one mentoring sessions. No matter where you are in the world, I can help you start and stick to your journey of change. And this is totally risk-free: you can try out how it would feel like working with me by scheduling a free 30-minute Skype call. I’ll be looking to hearing from you.